Slow Bullets won the 2016 Locus award for best Novella and was shortlisted for the Hugo (along with making a number of must read lists). As you would expect from a novella it's a short read at 192 pages but it packs in more ideas than many more weighty novels manage. Narrated in the first person by Scur at some point in the future, Slow Bullets begins at the end of a vast conflict between hundreds of human-colonised worlds. The "Central Planets" fighting against the "Peripheral Planets". On the brink of the ceasefire Scur is captured and tortured (injected with a titular "slow bullet") by ruthless war Criminal Orvin before being left for dead in the ruins of a bunker. She is revived aboard the prisoner transport vessel "Caprice" which seems to be in all kinds of trouble, not least with everyone being revived from sleep statis in an unknown area of space. Those who are familiar with Reynolds work will know that a re-occuring theme is that of memory, and memory is the underlies the story here. The slow bullets themselves are not an artifact of agression, instead being small implanted chips that record a persons past, their memories of themselves and their family. At the very beginning our Narrator Scur tells us she was force-ably injected with a second slow bullet and we never really know if this was successfully removed (Scur having passed out cutting it from her leg). This introduces us to the fact that Scur's memories may be unreliable. The fact that we may not be able to trust what Scur is saying (and who she really is) is underlined a number of times, small touches sowing the seeds of doubt such as when Orvin mentions "So Scur is what she calls herself now?". From the Narration itself memory then becomes part of the story when the inhabitants of the Caprice realise that the computer memory is failing and they must try and preserve as much as they can physically by writing on the metal walls and later on their own flesh. I won't go too much further into the story itself as it's worth encountering without spoiler but suffice to say it lives up to Reynolds usual epic scale. The book moves from memories of the individual to those of society and race, how it is all but impossible to keep a reliable record of the past and our faith in electronic storage is a short-sighted one. Not only is this book small, it's incredibly swift too. I read it in one sitting, one morning. There is no wasted space and most is devoted to moving the plot forward, a departure from much of the authors works with little time spent world-building or given over to exposition. Slow Bullets is incredible, it is a superbly balanced story packed full of ideas and subtlety. 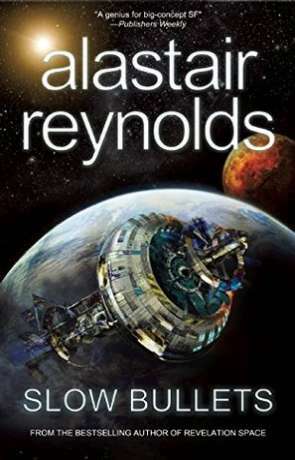 It's also not only the finest of Reynolds work so far but it's one of the finest nuggets of science fiction you could read anywhere. Written on 27th February 2017 by Ant.